Various technologies, processes and systems reject waste heat into the environment. This is either due to inefficiency or, in many cases, as a necessary and unavoidable part for functioning of a process. Heat energy is ejected by air conditioning and cooling of buildings and by many industrial processes, such as sewage treatment, manufacturing and cooling of computer centers, transformers food storage centres. Heat can be recovered from these sources as well as from natural ‘sinks’ such as ground or water systems such as rivers, lakes and resevoirs. The temperature of waste heat varies depending on the source. In industry, there are cases where waste heat can be utilised directly (with heat exchangers) for space heating and hot water, either locally or distributed via a community district heating network. More often, however, temperature of the waste heat is too low and requires the use of Heat Pump technology to boost it to a useful level. 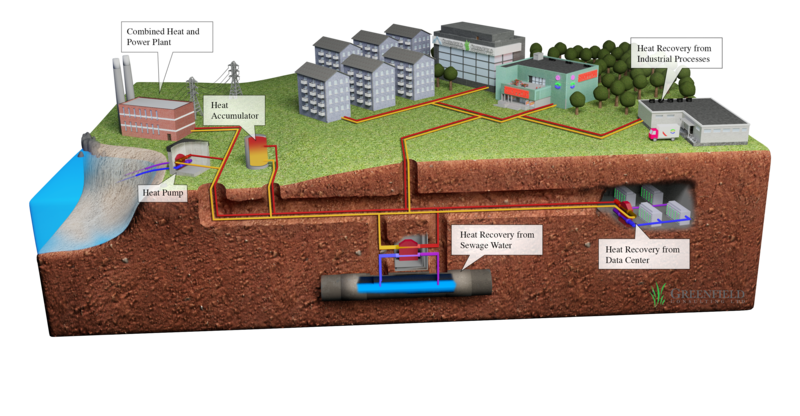 A district heating network enables the utilisation of local waste heat in other locations and opens the way to whole-system optimisation to improve overall efficiency. The most efficient community energy systems consist of integrated heating, cooling and electricity systems (DH. DC and CHP), including energy production, distribution, storage and consumption. By using intelligent technologies and innovative commercial approaches, energy generation and supply can take place in two directions: customers would sell and buy various types of energy, depending on their changing requirements.